Travis Beauchamp enters his 11th season at the helm of The Catholic University of America men's soccer team. In addition to his coaching duties, Beauchamp also works as the department’s operations assistant. 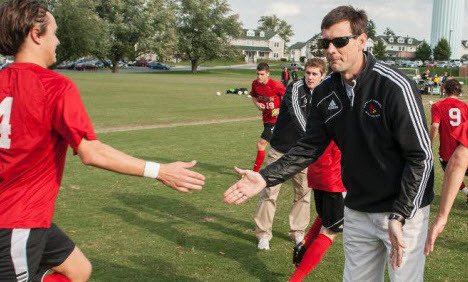 In ten seasons at Catholic, Beauchamp has led the Cardinals to 109 victories, four NCAA Tournament berths, two Landmark Conference championships, six Landmark Conference Tournament final appearances, and top 25 rankings (Mid-Atlantic Region, NSCAA, and D3soccer.com). Beauchamp's 100th career victory came in 2015 when he lead the Cardinals to a 1-0 road victory over No. 20 Salisbury University. Beauchamp lead the 2014 CUA men's soccer team to their first ever NCAA tournament win. The 2014 Cardinals finished in the top spot of the Landmark Conference for the fourth consecutive year and earned their third Landmark Conference Title, first since 2010, in a penalty kick shootout against the United States Merchant Marine Academy. In 2013, Beauchamp led the Cardinals to 12 wins and a berth in the NCAA Tournament after securing the No. 1 seed in the Landmark Conference Tournament with a 5-1-1 record. During the season, the team earned a No. 24 national ranking and reached as high as No. 3 in the Mid-Atlantic regional rankings. During the 2012 season, Beauchamp and the Cardinals won 13 matches, which included a 6-1 mark within the Landmark Conference, and was also nationally ranked by the NSCAA and D3soccer.com (No. 25). The 2011 Cardinals went 11 straight matches without a defeat, capturing the top seed in the Landmark Conference Tournament along the way. CUA downed Susquehanna in the tournament semifinals to earn a spot in the championship match for the fourth consecutive season. The 2010 season saw Beauchamp and the Cardinals capture their second straight Landmark Conference championship by advancing on penalty kicks against Merchant Marine Academy. With that win CUA became the first school in conference history to win back-to-back titles. The Cardinals also earned their second straight bid to the NCAA Tournament. For his efforts, Beauchamp and his assistants have won two Landmark Coaching staff of the Year awards (’08, ’11). He has also coached 29 All-Conference, 9 All-Region, and 1 1st team All-American during his tenure. Prior to arriving in the nation’s capital, Beauchamp worked as an assistant coach at USMMA for three seasons. The Mariners posted winning seasons during his time on campus with a combined record of 46-11-4. The coaching staff was honored with a Skyline Conference Coaching Staff of the Year award. Beauchamp's main duties included training, recruiting, scouting and video editing. He also served as the goalkeeper's coach and under his leadership had his players earn three All-Metro Region Goalkeeper awards. The Warsaw, Va., native played soccer and baseball at Washington College earning all-conference and all-region honors. Beauchamp's class at Washington moved into the record books posting the most wins in school history over a four-year career. He received bachelors and master's degrees in history from Washington and served as an assistant soccer and baseball coach for the Shoremen during graduate school. The former two-sport student-athlete was inducted into the Washington College Hall of Fame in October 2013. Additionally, in September 2015, Beauchamp was inducted into the Christchurch School Hall of Fame for his achievements as a 3-sport high school athlete. Beauchamp achieved extraordinary success on the athletic field during each of his four years at Christchurch, earning All-Prep honors in soccer, baseball and indoor track. Beauchamp is currently a member of the Division III Men's Soccer Committee, serving as the Mid-Atlantic Chairman since 2011. In 2014 he has been selected as the committee’s national chair. Beauchamp resides in Washington, D.C., with his wife, Dimitry, their son Wilton, born in 2010, and their daughter Eleanor, born in 2012. Connor Keenan joined the Catholic University men’s soccer coaching staff as an assistant coach in the fall of 2016. Keenan was a four-year letterwinner at Lycoming College that developed into one of the top goalkeepers in Warriors program history. As a senior, Keenan set the school’s single-season records for shutouts (11) and goals-against average (0.69) en route to First Team All-Mid-Atlantic Region honors. The Exton, Pa., native also set Lycoming’s career shutouts record during his senior season, finishing with a total of 21. Additionally, Keenan helped the Warriors start the year with a school-record 692 consecutive scoreless minutes, as they were the last team in Division III to allow a goal. As a junior, Keenan, posted a 0.91 goals-against average and earned Honorable Mention All-Commonwealth Conference honors. A two-time member of the MAC Academic Honor Roll and a one-time NSCAA Honorable Mention Scholar All-East Region pick, Keenan, graduated from Lycoming with a Bachelor of Arts in criminal justice in 2015. Keenan is currently working on his master in management in the CUA Metropolitan School of Professional Studies and resides in Washington, D.C.